There’s something irrepressibly alluring about apple brandy. Cocktails made with Calvados or American apple brandy have been among my favorites ever since I first dabbled in the drinks world, and every autumn and early winter for the past five or so years, I’ve found myself besmitten with these drinks all over again. Here are a few drinks with apple brandy that really hold their own. A recent favorite in my rotation is the Royal Union, created by Boston bartender Carrie Cole from Craigie on Main. Carrie gave me this recipe a few months ago, while I was working on a feature on cocktail bitters for Imbibe (and thanks to Lauren Clark for pointing me in Carrie’s direction). We wound up not running the drink recipe in the magazine — a couple of the ingredients may take a little searching to find, though they’re by no means rare or obscure — but Carrie gave me permission to put it here on the blog instead, where my dozen or so remaining readers can check it out for themselves. Stir well with ice until chilled, about 30 seconds. Strain into chilled old-fashioned glass – no ice, no garnish. Even with three kinds of amari, the Royal Union is still very gentle. Amaro Nonino tastes to me like souped-up rosso vermouth, and Averna is rich and chocolatey, with a note I always think of as “cola” but whenever I bring that up to other people I get a blank stare in return. 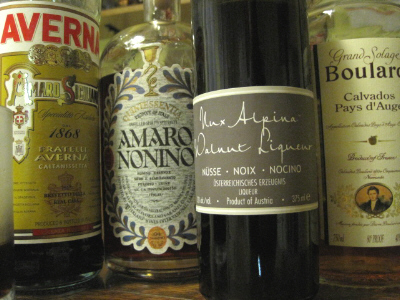 Nux Alpina brings this drink together — a walnut liqueur from Haus Alpenz, this pitch-black stuff has the back-palate bitterness of young walnuts, but a rich complexity that softens the finish, and the bitters add a little cinnamon zing to keep the dark, ponderous flavors in the glass from getting too serious about the whole thing. A few years ago, while working on an applejack story for Imbibe, I was introduced to another Boston bartender who had an affinity for apple booze: Misty Kalkofen. Now at Drink, Misty is one of my absolute favorite people in the industry, and someone with whom I don’t get nearly enough opportunities to work. At the time Misty was working at Green Street, and she’d come up with a rich, hearty drink that was perfect for cooler months, sweetened with maple syrup and given a French monastic touch with a dollop of Benedictine. At the time I wrote the piece, Misty and I were talking about applejack; nowadays I’m much more likely to use the Laird’s Bonded Apple Brandy in pretty much any drink calling for the American style of the spirit, and to my taste it works just dandy in this drink. Combine everything in a cocktail shaker and shake really hard, without ice, for at least 10 seconds, until the egg is pretty well mixed with the other ingredients. Add ice and shake again for at least 10 seconds; strain into chilled cocktail glass, and hit it with a few scrapes of nutmeg. Recently, though, I began a studious exploration of Baker’s books (or as studious as one can be while sampling through a cocktail book — hey, everyone’s gotta have a hobby), and the Pan American Clipper came up again. “Fine,” I thought. “A Jack Rose with an attitude, it is.” I twisted the knobs a little bit — Baker’s proportions are almost always kinda hinky, so I aimed for a little better balance — but otherwise the recipe is his. Shake well with ice, strain into chilled cocktail glass. Proceed. What I’d forgotten was how effectively absinthe can change everything. The snappy, fruity tartness of a Jack Rose is still there, but the absinthe tinkers with every aspect of the flavor equation. First there’s the aromatic tangle of absinthe’s ethereal herbaceousness, and then the fat vivaciousness of anise is the first flavor to arrive, coming in just before the citrus can poke its acidic elbow into your palate. Then, on the finish, that anise richness and herbaceous flourish is back, riding out on the sweet fruitiness of the pomegranate syrup. All in all, the Pan American Clipper is still simply a Jack Rose with a slightly different haircut. It’ll never be among my favorites, but it’s still pretty goddamn good.